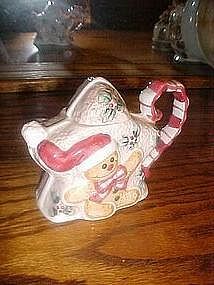 This sweet little creamer would make an adorable addition to your Christmas decor. A gingerbread Santa sits in front of a star cookie. The whole arrangement makes a cute holiday cream pitcher. All hand decorated glazed ceramic. Measures just over 4" tall. Brand new condition, and would make a lovely little gift.